Last winter was pretty brutal in Michigan (and many other parts of the United States and Canada). Many days my husband and I did not want to leave the house if we didn't have to. We had to come up with creative ideas to make ourselves look forward to yet another night sitting at home. Instead of watching the snow fall on Friday nights, we took a mental journey to a warm, tropical land by immersing ourselves in an Indian movie and snack night. Luckily there are tons of vegetarian Indian snacks and many of them are vegan too. I discovered this Sev Puri one day while perusing the shelves at a local Indian grocery store. You do not have to know anything about Indian food to make and eat this because just about everything you need is included and there are directions on the container. You only have to cook and chop a potato, chop an onion, and put all the ingredients together. You take the puri (cracker-like thing) and layer on cooked, chopped potato (if you wish), onion, and any other ingredients you like (I added chickpeas). Then add the sauces (included in the package), sev (the crunchy things that look like tiny vermicelli noodles), and garnish with fresh cilantro. This is a very easy and tasty snack that's good when you don't have a lot of time or ingredients. Click here to see the full line of Haldiram's snacks. yum! they look delicious. I love sev snacks so much. I was just at the Indian grocery store last week and it took great self control not to buy everything in sight. And, thank you so much for the most awesome translations of the text on my Indian shopping bags!!!! That MADE MY DAY. Haha! It takes a lot of self control on my part not to buy all the snacks too! I'm so glad we were able to make your day!!! 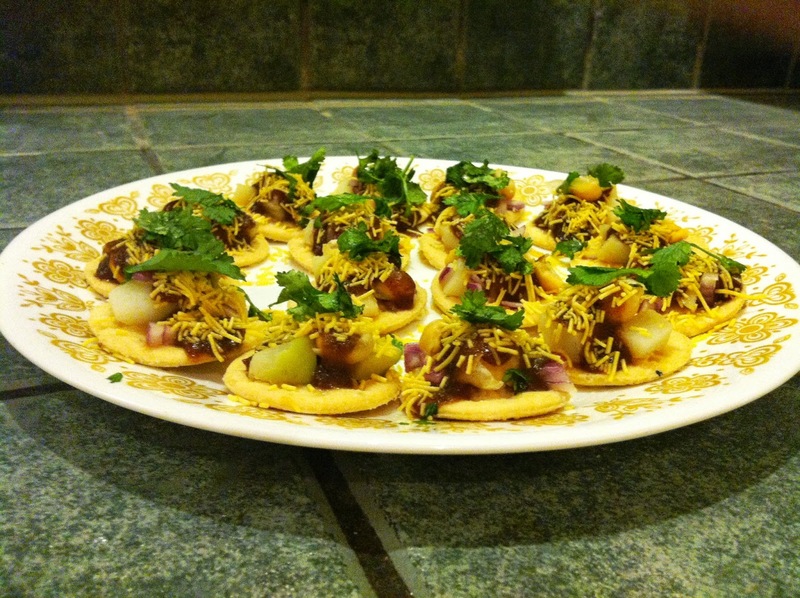 Sev Puri was one of my favorite things to eat when I was in India! I'll be on the lookout for these kits!